"... Earlier today, Dr. Hanan Ashrawi, a member of the PLO Executive Committee said that "the United States is squeezing us to open & direct negotiations with Israel." She said Washington is actively pressuring the Palestinian Authority and the League of the Arab countries. "The United States threatened to isolate the PA politically, if it refuses to open & direct negotiations with Israel ... It reached the level of blackmail ", claimed Ashrawi. "The truth is that it is very heavy pressure," said Ashrawi, "with all sincerity, in all my history in the negotiations, I have never seen such pressures on the Palestinian side." ".... Whatever progress Iran may make toward weapons of mass destruction, European diplomats and statesmen are likely to parade to Washington, concede America's concerns, affirm its intelligence findings -- and reject its policy recommendations. The United States would be advised to be patient and restock its economic sanctions kit for one more run at Tehran. In private, many strategists would summon their inner George Kennan and advise Washington that containment has worked with more powerful and unpredictable tyrants and can surely handle cautious mullahs and their rudimentary weapon. Washington would have to choose between an international coalition pledging rigorous containment of Iran, and the lonely, unpopular path of taking military action lacking allied consensus. Domestic consensus would be critical as well. One of the tragedies of American history is that presidents have too often entangled the country in conflicts without forthright conversation with the public. Franklin Roosevelt and Lyndon Johnson engaged in their share of measured mendacity as they plunged the United States into very different wars. More recently, Bush's decision to preemptively invade Iraq was characterized by exaggerated threats and faulty information. Obama came into office pledging a new politics of accountability and responsibility, suggesting a predisposition to engage the public on the possibility that the United States may find itself in a prolonged war with a damaged but dangerous adversary. From town halls to college campuses, the president and his advisers would need to connect with civil society, clergy and university students -- not to mention Congress -- on this critical issue. The direction such a debate would take is hard to predict. According to a February Gallup poll, about 90 percent of Americans believe Iran poses a serious threat to U.S. vital interests; 61 percent assessed the threat as "critical." A Fox News/Opinion Dynamics poll conducted in April found that 65 percent of Americans favor military force as a way to prevent Iran from acquiring nuclear weapons. There are plausible developments that could render this scenario moot. Iran has notified the International Atomic Energy Agency that it is prepared to resume negotiations after Ramadan on the transfer of nuclear fuel to third countries for enrichment. And in the face of strong sanctions, the mullahs may well blink. But to avoid the grim future postulated here, Iran would have to leave behind its peek-a-boo negotiating tactics and sign up for intrusive inspections and tight limits on its uranium enrichment activities. The record on this score is not encouraging, with decades of sanctions impeding but not blocking Iran's progress to nuclear weapons capability. Thus, the world imagined here may not constitute destiny -- but it will be hard to escape." "Palestinian reticence is grounded in a well-founded belief that Netanyahu has no intention of offering their minimum requirments..."
"... For its part, the Obama Administration's own motivation in pressing for direct talks is unclear, particularly at a moment when the gulf between the two sides makes reaching agreement highly unlikely. Netanyahu treats talks with the Palestinians as the beginning of a process that ought to be given years, with no reference to the two decades of peacemaking that preceded it (most of which he opposed). Abbas and the Arab League will only countenance talks on a limited timeline designed to achieve a final agreement based on previous negotiations. Forcing the parties together in direct talks will put the Israelis and Palestinians on the spot, but if they can't agree it will also put the U.S. on the spot. "These discussions are bound to expose just how large the gaps are between Israel and the Palestinians, and who is serious about reaching an agreement and who isn't. Does the President really want such a moment of truth this fall ...?" wrote former longtime U.S. Middle East peace negotiator Aaron David Miller on Thursday..."
Are Israelis that stupid or are they that ...stupid? Israeli TV keeps bestowing a hurried credibility on the Hariri tribunal: "Nasrallah himself ordered the assassination of Rafik Hariri ..."
"...Assad and Abdullah are alarmed by the political ferment set off by Hezbollah leader Sayyed Hassan Nasrallah this month when he said Hariri had told him the tribunal would indict "rogue" members of the Shi'ite guerrilla group for his father's killing. Nasrallah insists the government, which in principle supports the tribunal should reject any such indictments -- setting the scene for a paralyzing government crisis and revived Sunni-Shi'ite tensions, if not bloodshed as in 2008. Lebanese media quoted Hezbollah's deputy chief Naim Kassem as saying a change of government might become an issue if Hezbollah members were the target of indictments which he called "a project of strife, concocted by those who accuse us." The Hague-based tribunal says talk of indictments is speculation and the prosecutor will file them when he is ready. Hariri, then leading a broad anti-Syrian coalition, at first accused Damascus of killing his father. Syria denies this. Since he became prime minister last year, Hariri has dropped his anti-Syrian rhetoric and has visited Damascus several times to forge a rapprochement with Assad that matched a prior Syrian-Saudi reconciliation..."
Israel: "hariri tribunal to indict Mughniyeh's 'cousin'..."
"... According to an Israel TV report on Thursday night, Hariri’s son, the current Lebanese Prime Minister Saad Hariri, asked the tribunal to postpone releasing Din’s name, because of the potentially incendiary implications for Lebanon of such an announcement. Badr el Din, the cousin and brother- in-law of Mughniyeh, who was killed in a car bomb in Damascus in February 2008, was also reportedly responsible for planning the attempted assassination of the ruler of Kuwait in 1985, among other operations...."
"...Today, when Saad Hariri plays host to Assad, he will be looking for Syrian support to prevent another round of crippling violence enveloping Lebanon. Yet while conflict with Israel and outbreaks of complex sectarian warfare ... the UN finds itself at the frontline of an evolving conflict. Tensions between the UN peacekeepers and the residents of southern Lebanon are a reminder of the continued danger of unresolved conflicts. Over the past couple of months, several Unifil patrols, tasked with improving security in the south and facilitating the deployment of the Lebanese army, have been attacked by angry locals amid reports of soldiers being disarmed and stoned in their vehicles. Such was the concern over the disintegration of relations that France brought the issue up at the UN security council. The inadequate nature of the "no war, no peace" that characterises the situation in Lebanon may drag the UN into a more violent confrontation in the near future. Indeed, while the UN has been able to plaster over the cracks in Lebanon in the past, their role as mediator may soon become untenable. Instead, as Washington gave Syria the green light to extend its hegemony over Lebanon in 1991, the Riyadh-Damascus axis has emerged from the hubris of collapsed expectations in Iraq to become the real mediator of Lebanese politics." President Barack Obama renewed an emergency measure Thursday to freeze the assets of persons who work with Hezbollah militants and "infringe upon" Lebanese stability. The original executive order under president George W. Bush, continued by Obama, found that threats presented an "unusual and extraordinary threat to the foreign policy of the United States." The statement came hours after confirmation Syrian President Bashar al-Assad will visit Beirut on Friday for a summit aimed at easing tensions in Lebanon ..."
"Enough is enough .... "
With sanctions officially approved by the European Union ("EU") on Monday, a new phase in the effort to rein in Iran's nuclear ambitions has begun. The 27 nations comprising the EU adopted a package that is seen by many as the most effective action taken so far in that effort. Targeting shipping, transportation, insurance and even banking, these measures are seen by veteran observers here and abroad as having a profound effect on Iran's economic activities. According to informed sources, the measures were adopted amidst some heated debate. For example, Malta and Greece expressed concern about the adverse impact on their transportation operations. And Germany, though among the key players over the past years in talks concerning sanctions, was still wary, since it has the most to lose among EU members, in bi-lateral trade with Iran. The most effective measure, say well-informed diplomats, may be the restriction on providing refined products to Iran. Upwards of forty per cent of Iran's refined oil needs to be imported, despite being among the world's largest exporters of crude. "The regime [in Teheran] is running around looking for other sources," says one European diplomat. "They are genuinely shaken." The next step, say well-placed sources, is to make official demarches to other "like-minded" countries, notably South Korea and Japan. The Japanese are considered the more problematic of the two since they have little experience with the kind of government oversight needed to enforce sanctions. "There are many ways to circumvent and undermine sanctions like through using subsidiaries," notes one veteran US analyst. "The Japanese will have a steep learning curve." Moreover, says this official, Japan is concerned that economic rival, China, will step in and take over potentially lucrative contracts. Both Asian powers are dependent on Middle East energy sources and Japan has a long history of doing business with Iran. China remains the wild card in any assessment of the efficacy of sanctions. Optimists in the US government say that Beijing will continue to play its trade with Iran but not seek to expand its activities at the expense of others. Pessimists, especially among Israeli analysts, argue that Japan and others with long term interests in trading with Iran, have cause to be concerned. "China will obey the letter of UN resolutions, but not their spirit," says one senior Israeli official. This official also notes that India will "not be helpful" nor will Brazil and Turkey cease their efforts to mediate an agreement on terms favorable to Teheran. Coincidentally -- or not -- Greek Prime Minister Papandreau visited Israel last week. It was the first such high level mission from Athens in nearly two decades. It resulted in a joint pledge to forge closer ties]. While the ramifications of the deterioration in Israeli-Turkish relations may not have provided an opening for closer ties between Jerusalem and Athens, it is clear that not only Israel but the US is also frustrated with the Erdogan government in Ankara. President Obama has repeatedly spoken to the Turkish Prime Minister about Iran, but clearly has not been able to sway him. Some sources now see the prospect of a major turning point in US- Turkish relations. As one senior US official said late last month, "This relationship has become a one-way street, with us giving and the Turks only taking." Meanwhile, US-Israeli relations are on a better footing thanks, in part, to the meetings earlier this month between President Obama and Israel's Netanyahu. Stealing a line from former Secretary of State Henry Kissinger, one White House official noted that the talks were "doomed to succeed." This was because it clearly had become in the interests of both countries to close the perceived gap on two key issues, talks with the Palestinians and the way forward in dealing with Iran. On the latter issue, informed sources say the two leaders agreed on how far Iran has come in its nuclear development, the likely time line for future developments and, most important, that there is no acceptable alternative to preventing Iran from acquiring nuclear weapons capability. That being agreed, it appears that the Israelis are willing to focus all their attention on the "diplomatic" route (as one Israeli official puts it) at least until the beginning of next year. Even on the thorny question of talks with the Palestinians, both parties came away, at least initially, with an upbeat assessment. All efforts, they agreed, would be aimed at persuading Palestinian leader Abu Mazen to enter into direct talks, perhaps as early as next month. In the meantime, Israelis and Americans would engage in the perennial task of implementing "confidence building measures." For Israel, this means, among other things, allowing greater freedom of movement for West Bank Palestinians. And the US, shortly after Netanyahu left town, upgraded the diplomatic status of Abu Mazen's representative in Washington. Still, skepticism abounds, particularly on the US side [With Israelis taking satisfaction that, in one official's words, "The ball is now in the Palestinian court"]. The Palestinian leadership, say veteran US analysts, may need a lot more substantive measures before they are prepared to begin direct talks with the Netanyahu government. Even more worrisome to some observers is how quickly these talks could get bogged down once contentious issues such as the status of Jerusalem come to the surface. Some skeptics believe that the Administration, at this point, is not looking much past the fall elections. "I think everyone here would be quite happy to just launch negotiations and slide past the tough issues until after November," says one veteran observer. What will not wait until the mid-term elections here is an acceptable outcome to the Iraqi elections, now more than four months past. As Joint Chiefs of Staff Chairman Michael Mullen's visit to Baghdad this week demonstrated, the Administration is getting "fed up" (to use one US official's words) with the Iraqi leadership's inability to form a government. "Enough is enough," groused one State Department official. "They have been negotiating since the polls closed." And it has become apparent to the average iraqi, not to mention US officials, that the two leading contenders for Prime Minister, the current (caretaker) office holder Nouri al-Maliki and his rival, Ayad Allawi have become ever more intransigent. While few US analysts believe Allawi has a chance of gaining the post, Maliki still believe that he does. And it is his intransigence that upsets most US officials and increasingly members of his own party. On the ground, it is already having an effect as the US prepares to abandon its combat role at the end of August, leaving many Iraqis wondering if this will lead to increased Iranian influence as a power vacuum remains at the top in Baghdad. On practical issues, such as turning over "forward operating bases," progress cannot take place without firm direction from the top of a stable Iraqi government. And with the month long holiday of Ramadan less than two weeks away, it seems increasingly likely that matters will remain unresolved on September 1. .."
"..... the party was genuinely fearful that an STL indictment against it -- for the murder of the leading Sunni in the country -- might be added to an already formidable, though not insurmountable, "Cedar Revolution" cocktail of threats and weaknesses pressed by its many domestic, regional and international opponents. Indeed, more than the danger of another Israeli assault, it can be said that Hizbullah felt existentially threatened at the time by the prospect of an open civil war, aided and abetted by outside powers and fought along sectarian lines (mainly Sunni-Druze vs. Shiite). Hizbullah had learned, and painfully so, that its ultimate fight against Israel could not be properly conducted in times of internal bloodshed -- such as during the Amal-Hizbullah engagements of the late 1980s -- and that an STL indictment during a period of already high sectarian tension could tip the balance. Now, however, the party has reached a fundamentally different -- and more secure -- position of political, diplomatic and military power, not to mention ideological coherence. Which is precisely why one should not over-emphasize Hizbullah's concern vis-à-vis the STL's current (purported) track -- unless you are a partisan and/or polemicist and have a stake in shaping the course of the fight. It is not likely, therefore, as some Lebanese politicians and commentators have suggested in recent days, that Hizbullah is now gravely worried about its relationship with an "exonerated" Syria. This sort of counter factualism ignores the enduring common interests that Resistance Axis members share and will likely continue to share in the coming period as the momentum for a confrontation rather than a settlement apparently builds. "... we'll see whether Iran is doing this to try to forestall further action by specific countries ..."
"... The IAEA received a letter from Iran, State is reviewing it, but no news to report yet and no real comment on Turkish Foreign Minister Ahmet Davutoglu's claim that Iran is ready to talk and stop enriching toward 20 percent if there's a fuel swap deal. "you know, Iran has in recent months, you know, made a variety of public statements. Usually, they are heavily conditioned," Crowley said...."
"...As yet unclear and very closely held is whether Netanyahu confidentially agreed with Obama to extend a partial West Bank settlement freeze set to expire in September. Publicly, Netanyahu has said he can’t extend the freeze without Abbas agreeing to direct talks. “The [Obama] administration will tolerate just so much,” Wexler continued, referring to Abbas holding out on direct negotiations. “Abbas needs to be careful he does not overplay his hand with the administration. … My personal opinion is Abbas is better off long-term relying on the president's assurances, obtain immediate on-the-ground ‘good will’ gestures from Bibi, and test Bibi's declaration of willingness to make serious concessions for peace.”..."
Islamophobia and the Republicans: "Giving free rein to prejudices"
You could even argue whether being a Muslim is actually a religion or is it a nationality, way of life or cult, whatever you want to call it. The Ground Zero mosque project is not about religious tolerance. We permit thousands of mosques in our country, and Islam is not a religion. Islam is an ideology that has some spiritual elements, but strives for authoritarian control of every aspect of human life -- social, political, and economic. McCarthy then links to a screed purporting to link Imam Faisal Rauf, whose organization is spearheading the project, to the Muslim Brotherhood through Glenn Beck-style free conspiracy theorizing. But he need not -- he's already working backward from the conclusion that Islam is "not a religion" because it "strives for authoritarian control of every aspect of human life." (Christianity or Judaism for example, would never tell you exactly what you're allowed to eat or whom you're allowed to sleep with.) But the point is that while all bad people are not Muslims, all Muslims are bad. Why bother with a detailed conspiracy theory? As one of Josh Marshall's readers suggests, what's happened here is exactly what happened with torture, Gitmo, and using civilian trials to try terrorists. Free from the shackles of responsible governance and having to defend a Bush administration that insisted on characterizing Islam as a "religion of peace," they can give free rein to their prejudices and preferences. Hence the myth that Bush didn't have a default policy of trying most terrorism suspects in civilian court, the end of the once bipartisan agreement over closing Gitmo, and the forthright embrace of torture now that there's no need to defend Bush's insistence that "the United States does not torture." Once Republicans take back power, the policy implications of their current sensibilities will be unsustainable. But it will be too late, because they will have created a constituency that demands them." "... Authorities on both sides of the narrow Strait of Hormuz dismissed suggestions of a deliberate strike, however, pointing instead to natural causes. The U.S. naval fleet that patrols the region said the cause of the blast remains unclear. If the tanker was attacked, it would be a rare assault on a merchant ship in the Gulf or at the Strait of Hormuz, a transit point for about 40 percent of oil shipped by tankers worldwide. Al-Qaida has in the past carried out attacks on oil infrastructure on land ..."
"Phrases like ‘They have to change their behavior' -- this kind of preachy sermonizing, do not create much confidence..."
"... "Here's the problem," Limbert said. "For 30 years, careers were made both here and in Tehran by how nasty you could be to the other side and how creative you could be in being nasty to the other side. So if you're going to change that, what happens if it doesn't get some immediate result? It's very easy to slip back into what you always have been doing." Limbert says he worked hard during his tenure to tone down the language U.S. officials employed in talking about Iran during George W. Bush's administration. "Phrases like ‘They have to change their behavior' -- this kind of preachy sermonizing," he said, referring to a phrase often used by former secretary of state Condoleezza Rice, "do not create much confidence." Limbert said he sought to "make things less judgmental, more professional." As a result, "We are perhaps doing less yelling at each other. That's a pretty small step but compared to what's gone on over the last 30 years, maybe it's more important." Still, it's hard not to view Limbert's departure as a turning point and yet another missed opportunity in U.S.-Iran relations. A number of players with more skeptical views about the prospect of rapprochement with Tehran -- such as White House aide Dennis Ross and nonproliferation experts like Robert Einhorn and Gary Samore -- appear to be driving U.S. policy now, and the president himself blames the Iranian government for failing to respond to his outreach...."
Now, that's what I call 'serious'! "peace? Yeah maybe, but only if those pesky Arabs admit that we are the real landlords..."
"... In the more than 40 years that Israel has militarily occupied the West Bank, the Green Line – Israel’s pre-1967 borders – has been erased by the likes of illegal settlements, and road networks. Nowhere is this absorption of the Occupied Territories more apparent than in East Jerusalem, where close to 200,000 Israelis live in illegal settlements built in municipal boundaries that were expanded by Israel to include West Bank land. Reality in East Jerusalem in 2010 means municipal policies – supported by the Israeli state – that fly in the face of international law: Palestinian homes are demolished, the illegal separation wall carves up Palestinian neighborhoods, and residency rights are revoked. The gaping disparity between Israeli officials’ rhetoric in the West and their practice on the ground is no starker than in East Jerusalem. Israeli Prime Minister Benjamin Netanyahu and Jerusalem Mayor Nir Barkat assure journalists and diplomats that the city is “open” and “free” for all its inhabitants, the facts tell a different story – one of exclusion and discriminatory municipal policies..."
Saudi King to Netanyahu: "We'll burn Nasrallah at the stake ..."
"... Yet Nasrallah's panic paints a fascinating snapshot on the peace front: The Saudi king, the Lebanese government's patron, will be heading for a first official visit in Beirut on the weekend. The elderly Abdullah would not bother himself had he not been convinced there's someone to talk to and something to talk about. The fresh alliance between the rulers of Syria and Lebanon constitutes good potential to shake up the axis of evil, and Saudi Arabia would not spare any effort to spoil things for the Ayatollahs. Yet this is also a royal signal for Prime Minister Netanyahu: We'll create new order among the "bad guys," on condition that Israel finally responds to the Arab peace initiative, which was born in Saudi Arabia and was given a sweeping endorsement at the Arab Summit in Beirut. We should note that for eight years now, Israel had been keeping its eyes wide shut. The Saudi peace initiative contains a formula for resolving all the burning issues: Direct negotiations with Abbas, on condition that Israel commits to an independent Palestinian state; full peace and normalized ties with 45 Arab and Muslim states, on condition that Israel pledges to withdraw to the 1967 borders; a peace treaty with Syria will follow automatically. Yet there are no free rides: Jerusalem's division is on the agenda as well as "solutions agreed to by all parties" in respect to the right of return. For Israel, it's always convenient to see others do the dirty work, yet if all parties adhere to the plan being formulated at this time, and Syria manages to free itself of the Iranian bear hug, our turn shall come. 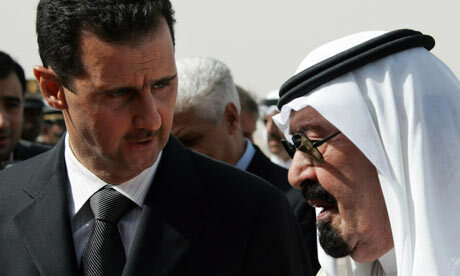 The Saudi king is also heading to Damascus to support Bashar Assad, whom the Ayatollah's are getting fed up with. Should they be able to burn Hezbollah at the stake without igniting Lebanon, the road shall be paved for renewing negotiations with Damascus. The price tag is known in advance. Assad has no intention of giving up even one inch." "...Mubarak had internalized the lessons of Sadat's assassination. ..."
"...Mr. Mubarak would confound the militants. In his years at the helm, he would stick to the big choices Sadat had made: He would stay in the orbit of the Pax Americana, and he would maintain the "cold peace" with Israel. The authoritarian, secular state, with the army as its mainstay, would keep its grip on political power. But there is no denying that Mr. Mubarak had internalized the lessons of Sadat's assassination..
Where Sadat openly embraced the distant American power, flaunted his American connections, and savored the attention of the American media, Mr. Mubarak has had an arm's length relationship with his American patrons. There was no need, he understood, to tempt the fates and to further inflame the anti-Western and anticolonial inheritance of his countrymen. America had come into Egypt in the aftermath of the 1973 October War. There were Egyptians who took to this new world and its possibilities, so keen were they to put the dreaded radical past with its privations and restrictions behind them. But a fault line divided the country. The pious and the traditionalists and those who believed that Egypt's place lay in the Arab world were offended by this new order. Mr. Mubarak would take U.S. aid. Second only to the American subsidy to Israel, it was crucial to his regime. There would be joint military exercises with U.S. forces. But the Egyptian ruler was keen to show his independence from American tutelage. Mr. Mubarak was under no compulsion to come up with an "electric shock" diplomacy of his own. He would, under duress, make a single, brief visit to Israel in 1995 for the burial of Yitzhak Rabin. He said little. The memorable funeral oration was made by the Jordanian monarch, King Hussein. ... A suspicious autocrat, he has stepped out of the way as a toxic brew came to poison the life of Egypt—a mix of antimodernism, anti-Americanism and anti-Semitism........ He rules by emergency decrees and has suffocated the country's political life, reducing the political landscape to something barren that he has been comfortable with: the authoritarian state on one side, the Muslim Brotherhood on the other. Nothing stirred or grew in the middle. No great upheaval has taken place in the Egypt of Hosni Mubarak. But the country on the banks of the Nile has stagnated. Its good cheer—one of its fabled attributes—has given way, and the crowded country now is an unhappy, bitter place......"
Mossad Chief in Saudi Arabia? Mossad chief Meir Dagan visited Saudi Arabia recently, if unofficial reports published over the weekend on the WorldNetDaily website are accurate. The Internet news site attributed the story to Arab sources. • Washington should implement a policy that contains Hizballah. No U.S. policy in Lebanon can succeed without an effective containment strategy for Hizballah, the single most powerful political and military actor in the country..."
"Mubarak is not a Zionist activist ..."
.... Mubarak is the sole Arab leader who does not fear Hezbollah, does not talk with Bashar Assad and is blocking Hamas. Together with Saudi Arabia, he is placing a solid wall against the spread of Iranian influence in the region, and is leading an axis once described as "moderate" which today faces a new axis in which the partners are Syria, Turkey, Iran and Iraq. Mubarak is in no rush to include the Turks, and like Israel he is concerned that Turkey is bolstering Hamas at the expense of the Palestinian Authority. He is concerned that Iranian involvement and Turkish participation may have a detrimental effect on the Arab League's initiative from 2002, which has become an important Arab common denominator that could guarantee an end to the conflict. New partners may not only bolster Syria at Egypt's expense - they are removed from local interests, including those of the Palestinians themselves, and all the more so of Israel....."
"His argument ran counter to years of leaks from the tribunal that have led many Lebanese to think that Syria would be implicated ..."
He confirmed for the first time that tribunal investigators had come to Lebanon this year to interview members of the group and said that, in his view, there was bias in their questioning, leading him to believe that not only were indictments a foregone conclusion but that the investigation had been held to target Hizbollah. His argument ran counter to years of speculation and leaks from the tribunal that have led many Lebanese to think that the Syrian regime would be implicated in the 2005 truck bombing of Hariri’s convoy. “All the data we have indicate that the charge sheet was written up before even the interrogation of our members,” Mr Nasrallah said. “The indictment is ready [and] it is only a matter of political timing. “We will not allow Sayyed Nasrallah to devastate the country like he did in July 2006 and in 2008,” MP Nadim Gemayel warned. “Moreover, we will not allow any international ruling to cause internal strife"........ and asked Mr Nasrallah whether he would like the group to adopt “Syria First or Iran First” as a new slogan, in a direct reference to the very close ties between those countries and the militant group." ".... Nearly a third of House Republicans have signed onto the resolution, which has been publicly discussed and circulated by its lead sponsor, Rep. Louie Gohmert (R-TX), for months. The National Iranian American Council is leading calls to oppose the measure, urging those concerned to demand that House Republican Leader John Boehner denounce the resolution. The introduction of the measure coincides with a pattern of renewed calls for military strikes that have escalated since President Obama signed "crippling" Congressional Iran sanctions into law. Neoconservatives who were instrumental in orchestrating the Iraq War, such as Bill Kristol, and Reuel Marc Gerecht, have led the stepped up calls for military action. Hawkish former Bush Administration official John Bolton recently laid out the game plan to prod Israel into attacking Iran, arguing that outsiders can "create broad support" for a strike by framing it as an issue of Israel's right to self defense........."
An Oxford Research Group report released recently reinforced those findings and also warned that an Israeli attack would be disastrous and would be unlikely to stop Iran's nuclear program. Instead, the report concluded attacks could convince Iran to withdraw from the international Nuclear Non-proliferation Treaty and to aggressively seek to develop nuclear weapons......."
"... it will be important for the US & Israel to help solidify Gamal Mubarak's rule ..."
A takeover by the Brotherhood would be a nightmare for the U.S. and Israel. Imagine the most populous regional state with the largest, best-equipped and -trained Arab army in the hands of this radical Islamist organization. Would Egypt continue to be a force for stability or, perish the thought, abrogate the peace treaty with Israel and conceivably even rejoin the conflict? Would Egypt be able to sit out a future round between Hezbollah and Israel?....A Muslim Brotherhoodtakeover in Egypt, along with the general rise of radical players in the region (Iran, Hezbollah and Hamas), would have negative ramifications for Saudi stability, too. Rarely has there been a regional issue of such importance for the United States and Israel about which they can do so little. Neither has a successful record of intervening in Arab politics, and any overt attempts to influence events might further undermine Gamal; the regime already is tainted by its relations with the U.S. and Israel. The United States already provides Egypt with major foreign aid, and an increase would only have an impact long after the succession, as would a renewal ofU.S. democratization efforts. Covert operations could be undertaken to weaken the opposition, but it is extremely unlikely that any external player could do more than Egypt's powerful security apparatus. No realistic external military option exists. "...is Hariri helping to sweep the issue under the rug?" "I agree with QN that this is probably the most important speech by HN in the last year – although if there is indeed war in the coming months then I would say HN’s articulation of how they view the coming conflict may have been more important…. I would not view the recent developments on the STL as an attempt welcomed in order to sweep the issue under the rug by the Hariri-Saudi axis. They know FULL WELL that this course is unacceptable for Hizbullah and Nasrallah. And they know full well that Hizbullah views this apparent trajectory as extremely dangerous. So it simply cannot be viewed by them as a nice way to deal with the STL and move on with rapprochement etc. It is a weapon, a card and a chink in Hizbullah’s armor – all at once. (If you want to view the Hariri-Saudi stance benignly you could argue that they are just trying their best to reign in a Hizbullah which could very well “provoke” or even launch a devastating war with Israel…. so even in its OFFENSIVE nature, the track is welcomed as a conflict mitigator because of the rejiggering of the balance of power and SWOT matrix (Strengths Weaknesses Opportunities Threats). With a major conflict possibly approaching, it seems that Hizbullah’s opponents and enemies are ready to strengthen themselves wherever they can – which makes since in a certain way for both the short, medium and long terms – since over the past four years they have mostly only counted their collective losses. ..... My real hope is that the Israelis do not read to much weakness into Hizbullah’s domestic political position as a result, and, when they get Iron Domed in November, dont feel confident enough to step into the war that many in the Israeli body politic seem to not want, but crave – dido for Hizbullah."